Watch the 5 minute learn zillion video. Learn Zillion: Represent 3d figures with nets. 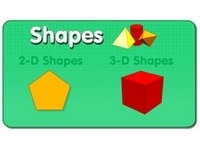 Interactive activity explaining3-d shapes and their nets. Log in and work to a smart score of 80 or more.